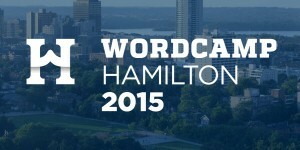 WordCamp Hamilton is coming up this Saturday! WordCamps are informal, community-organized conferences where you can learn about WordPress. This one is at McMaster Innovation Park on June 6. There are lots of people coming. There are going to be two “tracks” during the day. One will focus on sessions for WordPress beginners, bloggers, and designers. The other will be a more advanced, developer stream. You can even flip between tracks if there’s a session you’re really interested in. Plus, you’ll have a chance to meet other people who are using WordPress — WordPress enthusiasts even! Are you planning on writing a recap for those of us who couldn’t attend?